From the developers of Bravely Default and Bravely Second, “Project Octopath Traveler” will release worldwide simultaneously in 2018 exclusively for the Nintendo Switch. During today’s Nintendo Direct, we got a new look at the game, which features eight heroes and their eight stories. The style is termed “HD2D” and mixes 2D sprites and HD visuals. You will choose one of the eight characters’ scenarios, and each will have unique abilities called “path actions” that will be used to interact with NPCs in a unique way. For example, the warrior Olberic can challenge NPCs in the field while Primrose, a dancer, can allure NPCs into joining her party. Combat is a turn-based affair, but with a twist. You can build up Boost Point to strengthen existing actions or unleash chain attacks. A demo will be made available through the Nintendo Switch’s eShop where you can try the game out for yourself. A survey to collect feedback on the game will be made available at a later time. I never buy exclusives so this is a no go for me. So, in resume, you like to do the contrary to almost every other player out there, don’t you? That’s (really) weird, I mean, exclusives are what make every gaming platform different from each other!! Its also my wife’s name that was done way before all that! Huh neat looking game. 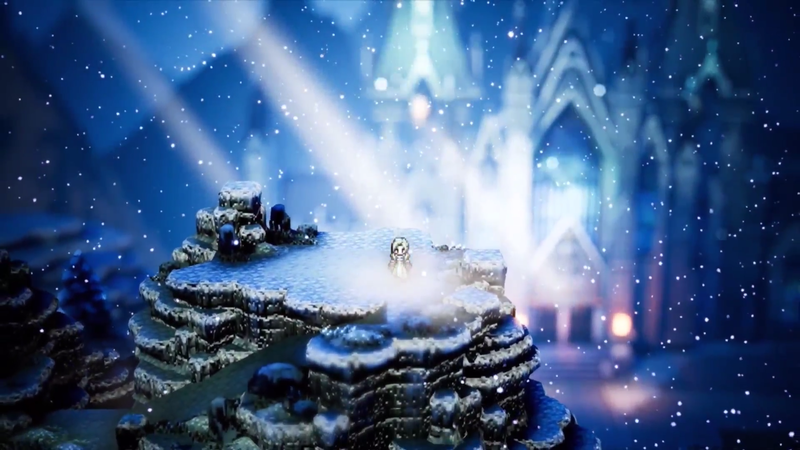 The gameplay of this looks like a mixture of the SaGa series, Bravely Default, and Four Heroes of Light. I really like the graphics and the gameplay looks interesting. The Boost System is like Bravely Default except that you can’t use different commands in a row. It’s either : Boosting one command or dealing several attacks in a row (Chain Attack). Will definitely buy the game :). Well, if I have a look in my collection then by far most of it also can be played on other consoled and/or PC. My logic just is that exclusives are not good for the gamers, they are only good for the companies who want to make more profit with it. So I never support them. Only my first game with the name Final Fantasy in it (Final Fantasy Crystal Chronicles) is an exclusive, but back then I was that young I hadn’t heard for the term yet. But all the game that I bought after that (mostly main line FF’s I have to say) can all be played on at least one other gaming device. Feedback – Add the Auto Subtitle and Skip the Cutscenes. And a way to control the battle frequency (like Bravely Default) ! Actually, I have never played it before. I know that Bravely Default is so popular.